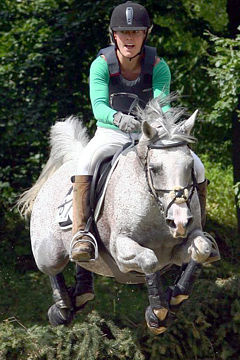 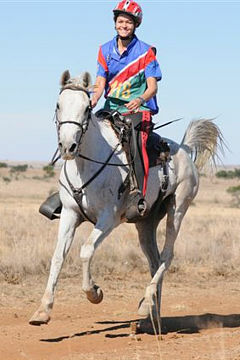 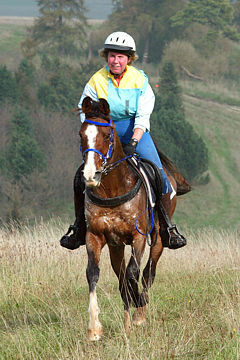 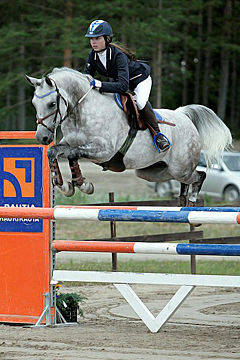 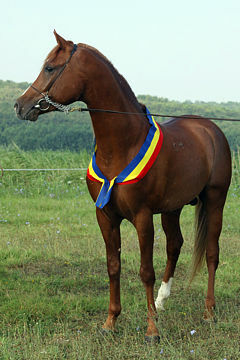 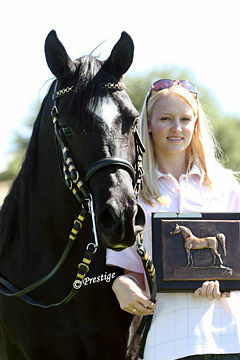 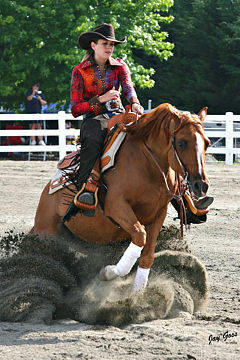 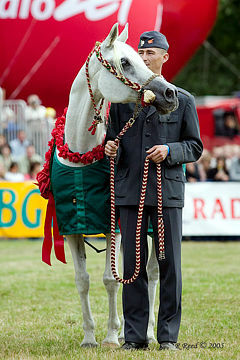 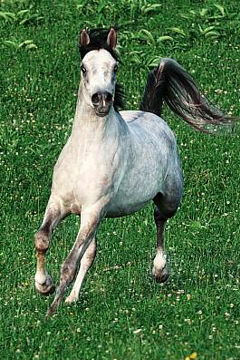 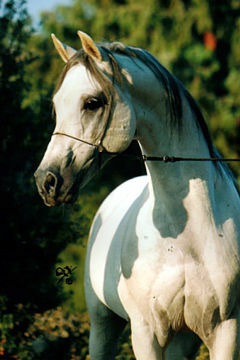 DA ADIOS, bay stallion, *1998 (Wiking/Sanibel IA). 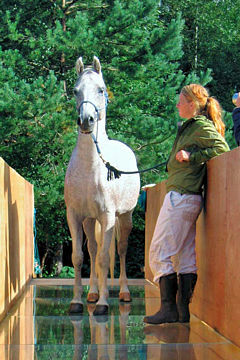 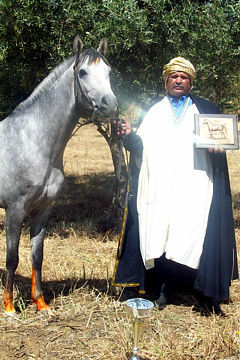 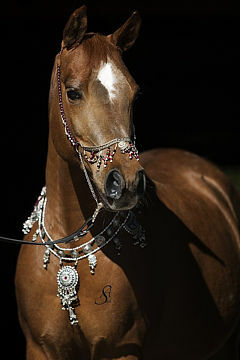 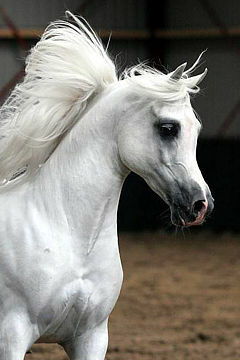 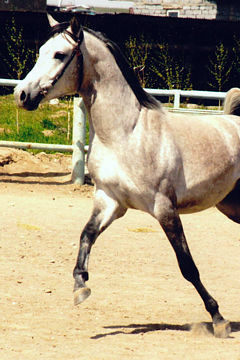 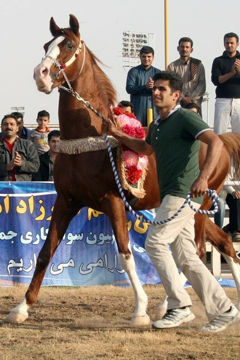 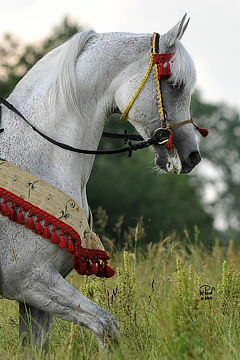 Breeder: Dunromin Arabians. 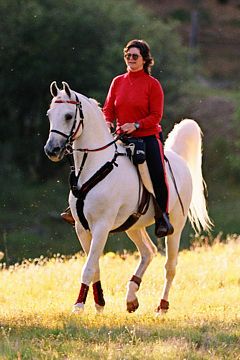 Owner: Cre Run Enterprises LLC, Alan Kirshner and Deborah Mihaloff-Kirshner. 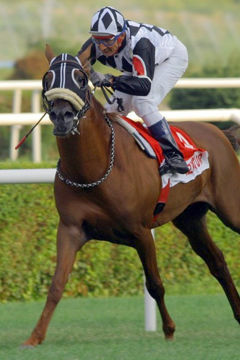 The Purebred Arabian Trust is proud to announce that the 2008 WAHO Trophy recipient for America is racetrack legend DA Adios. 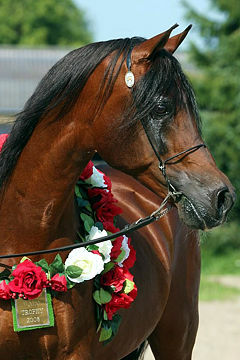 In 6 years of racing this attractive stallion garned an amazing 19 wins and placed a further 12 times from 34 runs, earning the all-time American record prize money of $622,048. 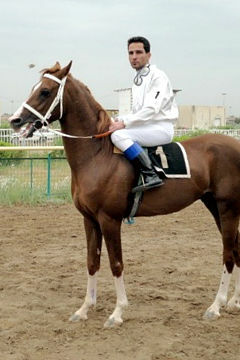 He won every major Arabian stakes race there is in USA, including the Grade 1 Arabian Cup Classic twice. 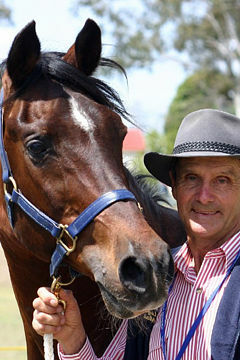 A five-time Darley winner (including Darley Horse of the Year twice), this compact bay has proven time and time again that it’s not the size of the horse, but the size of the heart that counts. 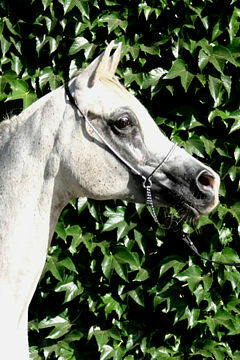 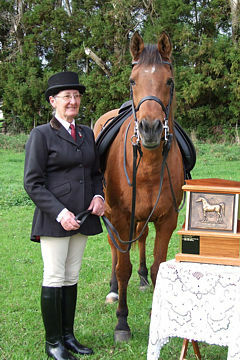 His first crop of foals were born in 2007. 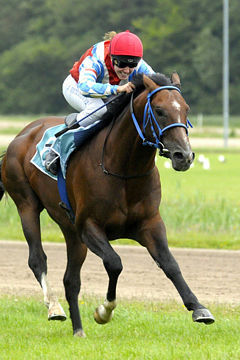 With his outstanding Polish racing heritage from his legendary sire Wiking and damline going back to the equally famous Sasanka, DA Adios has every attribute needed to become an important sire in his own right. 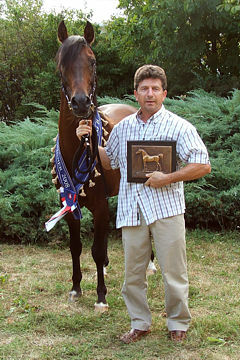 The Trophy Presentation for both the 2008 and 2009 USA WAHO Trophy winners was made at the same time, at the Scottsdale 2009 Show Photo L-R: Bob Fauls, (Purebred Arabian Trust President) Tim Shea (owner of Shea Stables, who stands Afire Bey V, 2009 WAHO Trophy winner for USA. 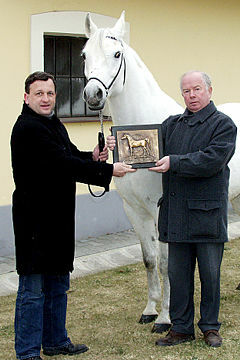 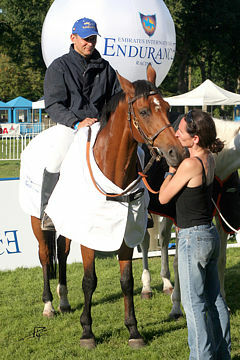 The horse is owned by Mr. David Liniger) Deborah Kirshner (Cre Run Farms, owner of DA Adios, 2008 WAHO Trophy winner for USA.) 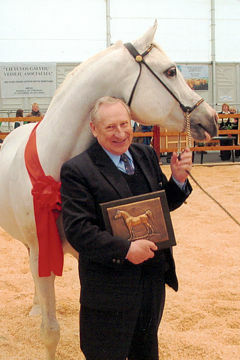 Howard Pike (Purebred Arabian Trust Executive Committee Member) Photo credit: Rick Osteen.